I stopped chasing dust bunnies at my house long enough to play with this sweet, little mouse from Crafty Secrets' Mouse Party set. 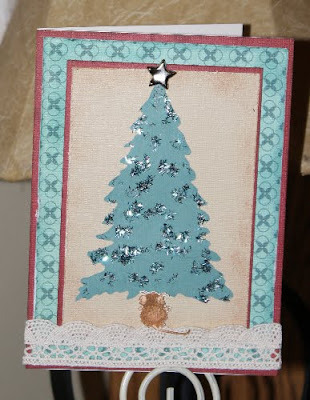 This week on the Crafty Secrets member forum on Splitcoast Stampers, Darlene challenged us to use lace on our projects. My daughter, Shannon, suggested I flip the lace with the scallops up, so that the mouse looks like he's sitting in the snow.